Why Is There a Stigma Attached to Being a Single Founder? Within contemporary startup culture, it's portrayed that successful businesses are started by a team, with each founding member offering complementary skills to the cause. There are, however, many successful businesses started by one person, Amazon provides a powerful recent example. Being a founder and having a startup does not require that you build a scalable technology company. Lifestyle and small business molds can be a good fit for single founders and provide lucrative paths, both financially and professionally. Investors drive the narrative that startups need to be scalable and started by teams, because they typically provide the highest potential for financial returns. Teams are also aligned with their interest as investors, due to the operational, governance, and equity burden splits between multiple founders. What Are the Pros and Cons of Going It Alone with a Single-person Startup? Full control: Freedom to build exactly what you want, to your exact specification. Grow at your pace: Space to choose how to deploy the cash flow in the business. Self development: Opportunity to learn topics outside of your core arena and iterate with various productivity hacks. Equity: The control and economics of the business will remain on your side. Lonely: It can be an existence of solitude that requires constant self motivation. Quixotic pursuits: Your bias and lack of neutral counsel could lead you down some dead ends. Investment: It can be harder to raise money as a solo founder, which may result in ceding advantage to deeper-pocketed competitors. Perception: Potential employees, customers, and investors may perceive you as being an autocrat, which may limit options. You will need to have a grasp of all rudimentary concepts related to your business—even if you delegate tasks, you cannot do it blindly. To succeed, you need to be consistently open to learning and grasping new things quickly. Delegation to both people and machines will allow you to scale your efforts and focus on the core task at hand. Embrace SaaS/subscription-based services and freelance talent to help you with areas that are not your core strength. You can create proxy co-founders by carefully choosing your first hires. The mix of the wide work remit on offer and stock options will correctly incentive early staff members. Change your environment regularly to refresh your senses and build our your personal network. Don't use your bedroom as an office. Approach raising investment differently from the story that you read in the press. Become your own version of a celebrity founder by focusing on highlighting how your track record and career has led you to this point. Try to get investors to come to you by appearing in their data mining efforts. Promote yourself strategically online and through sources of private company data. The negotiation dynamic flips when you receive inbound interest. A core tenet of contemporary entrepreneurship teaching is that new ventures are founded by teams, with such teams being an amalgamation of talented individuals that offer complementary skillsets across a spectrum of disciplines. The most eloquent way that I have seen this described is that an ideal startup team has a hacker, a hipster, and a hustler—broad terms for representing skills in engineering, design, and business, respectively. When it comes to the preferences of investors, it’s usually clear what kinds of businesses they won’t want to invest in. Exclusions can be given due to the stage of the business, its geography, target customer or for industry ethics. When it comes to the people being invested in, aside from character traits, the core exclusion points are if founders are in a relationship, or if there is only one founder. Investors generally want to back teams that have come together for the sole purpose of creating an exceptional business. Yet, what would you think if you knew that the founder of the (almost) first company to reach a trillion dollar market capitalization did it alone? Yes, in 1994, when Jeff Bezos incorporated the business named Cadabra, Inc, his first steps towards greatness at Amazon were made entirely on his own. This article will address the stigmas attached to running a single-person startup, assessing whether they are valid or just scaremongering. This assessment will be followed by a playbook to guide potential solo founders thinking about starting a new venture. What Is a Startup? What Is a Founder? The first concept to understand is that we are living in an era where it is de rigueur to be a founder and “have” a startup, in a similar aspirational vein to being a banker up until 2008. This, though, has warped the perception of a founder and led to some inflation of the title’s meaning. A founder of a startup is anyone that incorporates and starts a new business, injecting the initial capital into its operations, financially or via sweat. That could range from a lemonade stand to a bank. You don’t have to be a wearing a hoodie, living in a basement, and making an app to be a founder. Steve Blank does a clear job of defining what types of startups exist, and the first two are types that people would not normally classify as such: lifestyle startups and small businesses. As the cliché goes, small businesses are the backbone of any economy: 89.4% of US firms employ fewer than 20 people. Lifestyle businesses are also an on-point topic, due to the rise of the gig economy. Despite not being hyper growth scale-up businesses, they are still startups to be managed, with the same concerns as others, just at a smaller scale. A cursory glance of your LinkedIn contacts will show that many people now class themselves as entrepreneurs or founders. You’ll see managers of teams in large corporates branding themselves as “founders” of their team. So these terms are used very loosely, and their meaning is whatever you want to make of it. Speaking for myself, when I do financial consulting, I work alone, based out of different locations and I eat what I hunt. I could class myself as the founding partner of a boutique global consulting firm, or I could class myself as a self-employed gig economy worker. Whatever way it’s put, the same work is going on behind the scenes. Job titles are merely a construct of marketing and self-branding. Do Venture Capitalists Invest in Solo Founders? The narrative that you should not start a startup on your own is driven by investors who, for their own interests, prefer that a team is in place. This is driven by some mutually beneficial alignment, in terms of the need to share skills, ideas, and workloads. But some of the intent is driven by the need to protect an investment, to ensure that it returns a significant amount. Contradictory to this view, a survey of Crunchbase data by TechCrunch showed that single founder companies actually were the most common size of team for both raising more than $10 million in capital and having an “exit” of some kind. The data is certainly surprising—for example, the average size of an exited startup’s founding team is 1.72. It corroborates the view that teams with a compelling “origin” story get the lion’s share of the press while, behind the scenes, there are a vast number of one-person businesses grinding away. Unfortunately, I think the data does have to be taken with a pinch of salt. Tools like Crunchbase rely a lot on self-certification and at times, pages for companies can appear incomplete. A startup may appear to have one co-founder if one of the team is more visible in the public eye due to handling media duties. There is also contrasting data from First Round Capital (a VC) that purports that teams outperform solo founders by 163% and have higher seed valuations by 25%. Here are some reasons why venture capitalists prefer not to invest in single-person startups. A solo founder will own the entirety of the founding stock in a business, which will ensure that, assuming money is raised, they will control the board on their own, for a long period of time. With teams, the founders act as a bloc, but their individual power wanes over time with dilution. The usefulness of investing in a bloc is on the assumption that rational choices will prevail via consensus in a team. This is more appealing than investing in one person with absolute power. For investors, there is also an element of existential risk by investing in one person. This presents more stark outcomes for the investment if the founder falls ill, loses interest, or changes the business direction erratically. A founder in a single-person startup will theoretically be able to pay themselves more, as the expenses budget has fewer mouths to feed. This could, in the eyes of some, present an agency cost between investor and investee, whereby the founder isn’t as hungry to chase their payout via a big exit. Investors are also looking to invest in businesses that can make them a huge return, over ten times their original investment. For that, they are not looking to invest in lifestyle businesses, which solo founder businesses could be perceived to be. Yet, a lifestyle business is perfectly fine if you are the founder. Using me as an example, my work is great for me, but in its current incarnation, it won’t move the needle for an agnostic investor. A lot of startup web content out there is being written by investors, which gives the impression that it’s suboptimal to have a lifestyle business. To clarify, this would only be suboptimal from an investor’s perspective. Is a Single-person Startup Right for You? If you are considering starting a startup, either a lifestyle business or the next Amazon, the choice of whether to go it alone is yours. The decision should be based more on your fit with this kind of career, over more prosaic choices like, “Will I get investors?” Good companies get invested in eventually, irrespective of their founding team size. You can do exactly what you want. For stubborn, decisive, and introverted (Think: INTJ) people, starting your own business can be an attractive prospect. You will live and die by your own decisions and make no compromises. Grow at your own pace. The potential aversion of investors towards solo founders will mean you will have to bootstrap and be careful with growth. The benefit of this is that you can iterate slowly and take gratification from the progress made. Explore the limits of your own capacity. You will be stretched, but for types that like productivity hacks, outsourcing, and self-development, starting a one-person business will be your own petri dish of “Ferrissian” experiments. Keep all the equity and control. If, and a big if, your business succeeds, you will reap the windfall and keep it all for yourself. It will be lonely. There are ways to mitigate this, but one core reason why teams are celebrated is for the camaraderie and journey taken together. Bias may ruin you. Your stubbornness and lack of pushback may lead you down dead ends. Limited investment options. The difficulty in raising funds could stall growth and/or lead to you ceding advantage to faster competitors. Potential employees may shun you. Some workers may not find it appealing to join a single-person startup, due to the risk to them of having to abide by a solo founder’s idiosyncrasies. There are countless playbooks for startup success out there, which will apply to both teams and solo founders. But the following are themes that I have encountered through my work that are most applicable to those going alone. In a team-based startup, if you’re the CFO, then with a degree of comfort, you can safely leave any tech-related aspects to the CTO. As a solo founder, the emphasis on you learning and being involved in all directions of your business will be paramount. A rudimentary knowledge of everything will have both its timing and intellectual constraints but is also fascinating for those who like to learn. This is important for growing your business because you will be the only one making the decisions. But it’s equally as important when projecting your business to the outside world, be it clients, investors, or new staff members. Fortunately, the internet is a treasure trove of free resources for self-learning and development. Everything from MOOCs to YouTube has knowledge of subjects ranging from the broad to niche. When I need to learn a new topic, I start at the very top, getting a brief but broad overview of the entire sector before diving down into specialized topics. I set aside part of one day each week to try and learn something new related to do the work I do. A core disadvantage of running a single-person company is being able to maintain bandwidth to undertake the jobs to be done. The lack of differing opinion and pushback from others can also result in some work being a quixotic waste of time. Yet, this can be mitigated. Delegation is critical and, in this era of distributed teams and everything-as-a-service, it is possible to outsource activities to both people and machines. 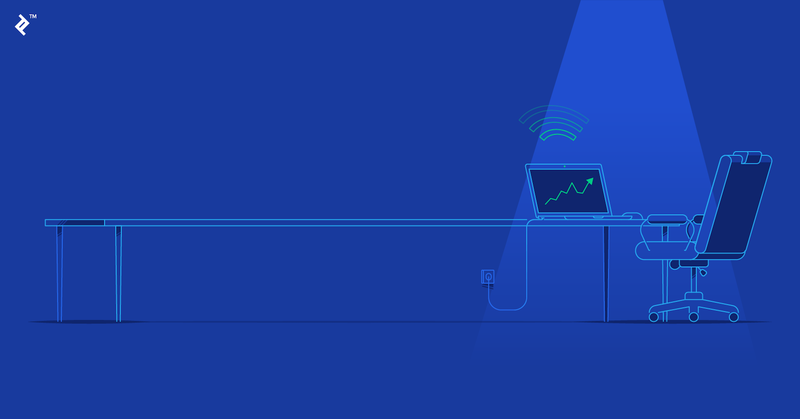 SaaS and freelance services push CAPEX into OPEX and make growth manageable, both financially and in terms of founder bandwidth. Being a solo founder doesn’t mean that you will be working alone forever, you will need to hire staff and such staff, if correctly incentivized, can act as proxy co-founders. The wide swath of work available due to your lack of co-founders, when combined with fair stock option grants, should be an appropriate carrot on a stick for ambitious talent. In terms of how to delegate, it’s best to follow the laws of comparative advantage. What are you best at? Divide your time appropriately between the skills that you are good at and leading the higher direction of the business. A failure to do so will result in suboptimal work and poor strategic decision-making. 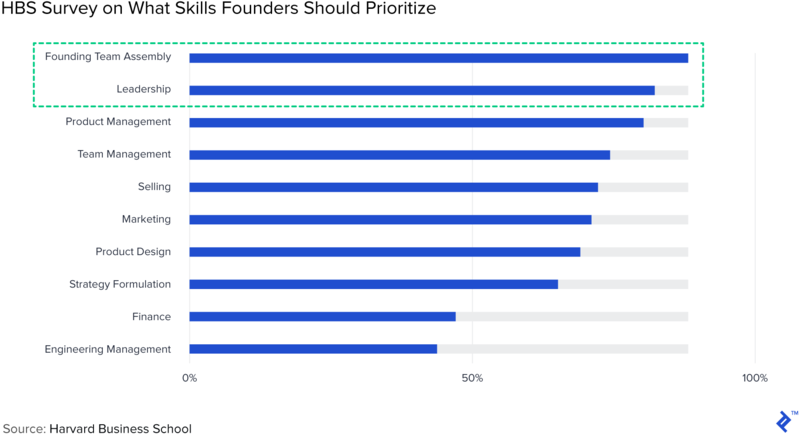 In terms of what skills should be prioritized, solo founders may even be at a slight advantage, wherein the most common skills that they need to focus on are actually not required if they are venturing solo. We also tend to think that we are being productive when we are doing menial administrative tasks. Focus on tasks that produce proactive value (i.e., business development), not reactive response (i.e., invoicing). Virtual assistants can be a useful tool for the solo founder for delegating out menial tasks. Working on a single-person business in your basement will not be an effective environment. It’s a lonely existence and aside from the lack of contrarian pushback from co-founders, you will reduce your exposure to stimulating factors by a large degree. Embrace an open-minded culture, get yourself out of the house and into a coworking space, or at a minimum, a coffee shop. If your business is sufficiently virtual, then use travel as a chance to change your perspective. This will also have knock-on effects for business development, marketing, and HR efforts as, the wider net that you cast, the deeper the nodes that will run within your personal network. Enrolling yourself into an accelerator may act as a sufficient enough shot of adrenaline or a point in which to find a co-founder, if necessary. Governments are also increasingly supporting entrepreneurship through grants and programs that both provide funding and interactive environments. I have worked with a couple of businesses that entered the Startup Chile program, and aside from the funding, the social learning element of it was critical. Returning to the genesis of the article: the stigma attached to single-founders is that it is difficult to fundraise. But say, you have begun a business as a single founder and it’s getting to the point where you need capital to expand, how can you achieve this? Entrepreneurs with a track record have a better chance of raising money as a single-person startup. If someone is covered in stardust, investors will know that they can execute and form a team around them. Whether they are doing this alone or with others becomes superfluous. If you are not a celebrity founder, don’t fear. Instead, lean on your own career track record. If you are starting a one-person business that is related to your past career inside a corporate, then exploit this tangent and emphasize it considerably. Present your venture as a confluence of events that have built up from skills garnered throughout your career, not as an opportunistic output of a quarter-life crisis. Assuming that you start your venture with your own capital and start getting a degree of traction, with some careful preparation, you will eventually solicit inbound interest. The negotiation dynamic completely switches when you receive inbound interest, and dropping in that you are solo founder then becomes an issue for the investor, not for you. Aside from executing a great business and generating some traction, make sure to leave your businesses footprint all over the web. Manage your SEO, engage in social media, and provide as much data as possible to self-certification sites. Private startup data is notoriously difficult to scrape, so many sites allow you to self-submit data. Assuming that you have nothing to hide, embrace this and eventually, a machine, or an analyst at a firm, will stumble upon you. By “alternative” here, I am basically referring to investors that would not class themselves as venture capitalists. You do not have to go down the route that you see every day in the tech media. Raising money is not like applying to college—there is no set path. Bootstrap. An obvious point, but a luxury that not all will have. Accelerators and grants. As mentioned earlier, these can be as valuable for their intangible benefits as their tangible ones. Working capital management and trade financing. Assuming that you’re growing a small business prudently, it’s most likely that you will be making accounting profits in the near future. An impediment to growth though will be your cash conversion cycle and the ability to fund growth with cash flow. Aside from managing this carefully, trade invoice services may provide you with the cash flow that you require during times of need, over pure equity financing. Debt. Lenders like to see a track record, stability, and assets on a balance sheet. That’s why most early-stage startups do not get the luxury of borrowing. If you generate a combination of these three factors, then there could be a chance of getting a loan or, alternatively, peer to peer or short-term facilities may be appropriate. Equity crowdfunding.Raising equity from retail investors is not “easier” and does not have more relaxed terms. Retail investors, though, invest with a different mentality. They like being evangelists for a product/service and empathizing with founder backstories. What I do say, though, is to reject the concept that you have to follow a “process” to build a business or a startup. As mentioned, the terms “founders” and “startups” are as much descriptive nouns as they are aspirational adjectives. Most successful businesses are started by teams, but if it’s such that you want to go it alone, or that you have not found your perfect co-founder, then you can go it alone without prejudice. The key lesson is to decide what kind of business you want to have. Do you want to be rich, be in control, or have a healthier work-life balance? Once you know what you want, you will be better prepared to face the compromises of going it alone. Who is the founder of a company? The founder of a business is a person involved in the ideation and incorporation of a new business. They will also have contributed to the initial capital injected into the operation, via their own financial investment and/or sweat equity. What is a business owned by a single person called? A business that has been created by a single person, or a solo founder, can be referred to in the same way as any other business formed by a team. Depending on the preference of the founder, it can be defined as a business, a startup, or a venture. Hi Alex, Thanks for this Details explanation, The Post Clarify my lots of questions. Loved all the suggestions. Just one question, Is it important to register your startup or Company as PVT LTD or ISO, whether you are running it as single person? Not the definitive answer that you might be looking for, but, it's best to discuss that choice with an accountant/lawyer for the territory that you're looking to enter. Hey Alex Thanks For sharing this in depth details. this article clear lots of our doubts on for startups. Home › Blog › Should You Go It Alone with a Single-person Startup?